AnyJunk is the UK’s largest rubbish clearance company. We specialise in on-demand collection of bulky waste. Utilising our state of the art tech platform, our nationwide network of man & van teams can remove any type of non-hazardous bulky waste - from old furniture and appliances, to garden refuse, fly-tipped rubbish and builders waste – from anywhere on the property on a next or same day basis. We also offer skips and bulk bags if the job requires, as a one-stop shop for waste. Multi-award winning, we have been operating for more than 10 years and work with many of the UK’s leading FM companies, contractors and landlords. 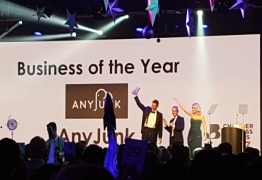 AnyJunk wins the national award for Best Use of Technology and overall national Business of the Year at the Chamber Business Awards 2017 hosted by the British Chambers of Commerce.